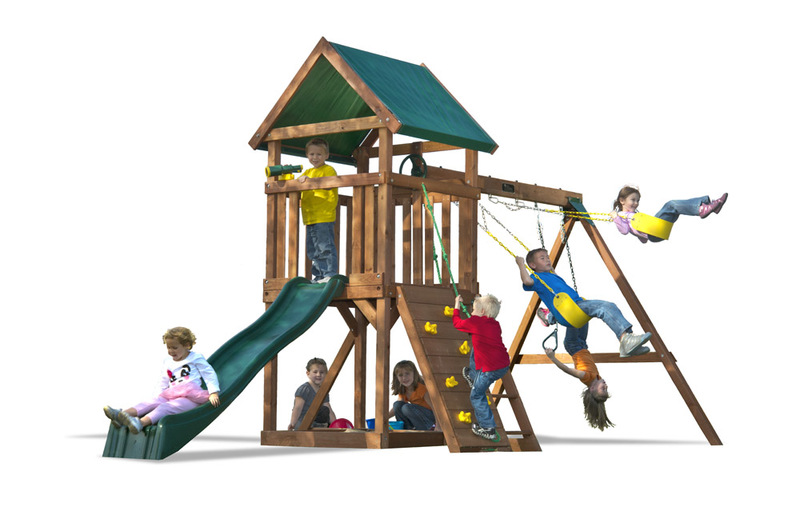 An affordable swing set loaded with adventure. The High Flyer backyard swing set has something for everyone. 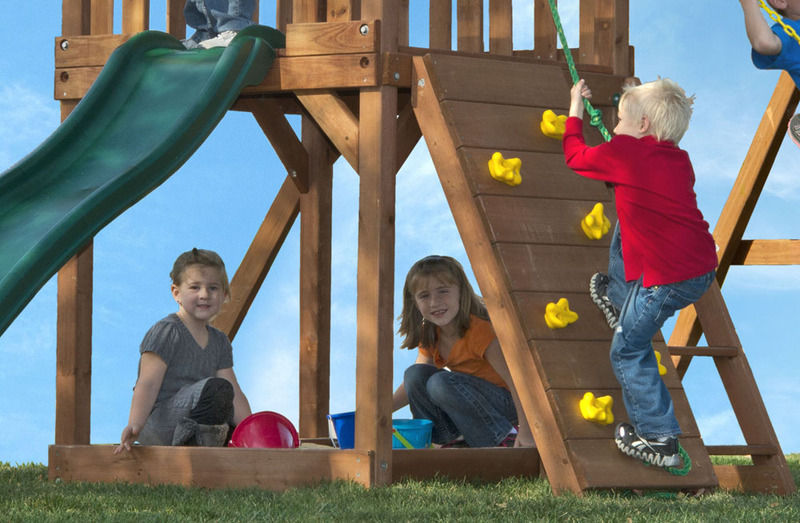 Swinging, climbing, sliding or hiding, this swing set has multiple activities for every child to enjoy including a slide and sandbox. 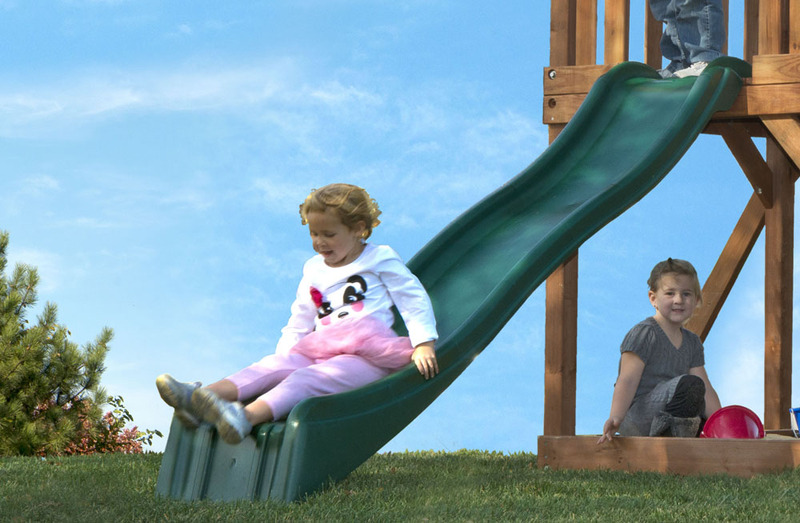 If your child is looking for a safe and exhilarating ride, the 8' wave slide will become the center of attention. Next, your child will climb the adventurous rock climbing wall to get acquainted with the play deck and will glance into the swiveling telescope to get a close up view of their surroundings. After a fun-filled day of play, your child may relax under the vinyl canopy or sandbox as well. This starter set is perfect for small backyards that don't have the length or width to fit a full size swing set. 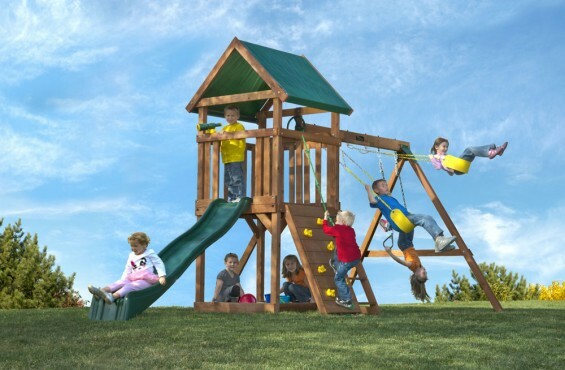 Finally, an affordable backyard swing set with all the play activities a child loves at a price that won't put your child's college savings behind. 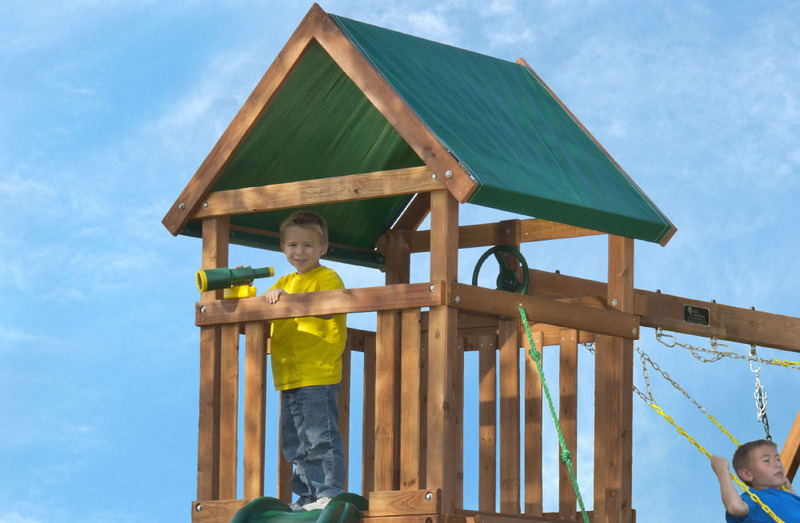 While our cedar swing sets are hand-crafted to eliminate unnecessary cuts and scrapes, we suggest adding a fall surface under your play structure to add another layer of protection for your children – just in case they lose their balance and fall. 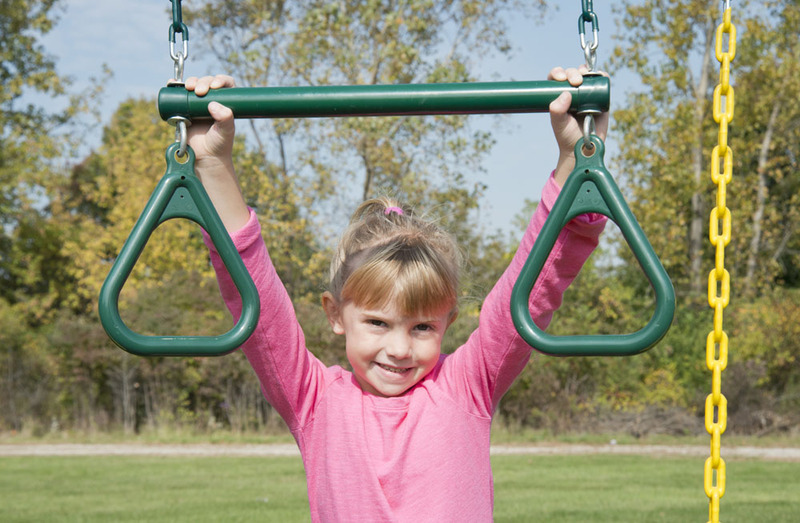 We recommend to add rubber mats, rubber mulch, wood chips sand or pea gravel under your swing set. To see a pros and cons list of the best materials for under a swing set, check out the resources tab on this page. For a detailed guide on playground set fall surfaces, be sure to check out our resources tab on this page. 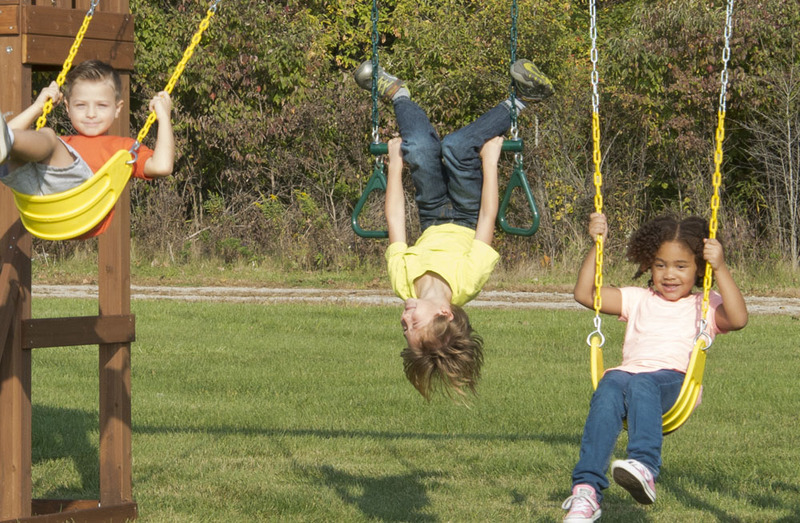 This swing set is intended for residential use only and is not warrantied for public or commercial use. Once your swing set is ready to ship from our shop in Monroe, MI, the delivery company will contact you to schedule a delivery date and time. The typical swing set will be delivered curbside and comes in multiple bundles/boxes. Some larger packages may need to be opened and hand offloaded to the ground. It might be helpful to have another person help you bring the components into your backyard, but it not a necessity. I have a small yard; will this swing set be a good fit for my backyard? 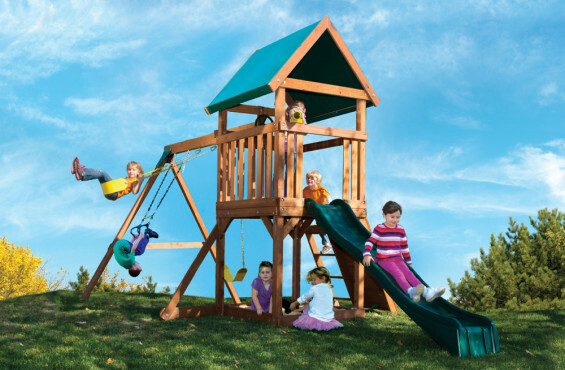 The High Flyer is the smallest swing set we offer, so if you’re lacking backyard space, this model might be your best choice. The High Flyer swing set is factory stained to provide a beautiful finish and long lasting protection. We recommend staining wooden swing sets once a year to maintain its rich color and naturally resilient qualities. Prior to staining, clean all wooden components. Use a high quality water based stain or sealant such as Thompson’s Water Seal® . After staining or sealing, please allow 24 hours to dry before allowing children to start their adventure. Great playset. Very sturdy design, and has held up to the weather. Assembled solo and was very doable. Good and sturdy materials , however paint has faded on wood and the play set is only 5 months old. My review is not so much for the play set as it is for the customer service. I purchased the play set used and had no idea if all the parts were there or how to assemble them. I called the customer service dept. and they sent me a copy of the instruction manual and when needed parts they walked me through what parts I would need and also gave suggestions on maximizing shipping. My daughter absolutely loves her play set and feel good about calling again when she wears something out. We were very happy with the swing set, but the wood started to split and this was before winter even began. We were working with a company (through you guys) who was ordering replacement parts, but we have yet to hear from them. We thought we would be contacted once winter was over, but still nothing as of yet. Great swingset. Nice and Sturdy! Our kids love their swingset. We have 4 children under 5 years old and there is something for everyone to do, at all times. WE definitely recommend this set! Took a few days to assemble and needed an extra pair of hands to assemble. The kids love it and so do the other kids in the neighborhood. This play set is the perfect size for our 3 young kids (2-5) and should be for the next few years at least! The wood is scratched and has faded over the year we've had it but it doesn't seem to bother the kids at all. The rock wall is a hit though sometimes I wish we had all 3 swings instead of the trapeze so they wouldn't fight over them. Overall great value assuming it lasts another 5 years. Overall this is an "ok" swing set. I was very disappointed when we received the initial shipment because we had several very damaged pieces and some missing pieces as well. When we called for replacements the company said they would send us new parts, but when they arrived they were the wrong parts! It took a long time to get everything we needed to complete the swing set. My kids love the swing set. My grandchildren love this swing set. They play for hours with it.The dog can go up the slide and slide down with them .I so happy I purchased this set..